Shakespeare enthusiasts from The Sixth Form College, Solihull took part in an interactive talk on at Keele University at the end of term. Two Academics from the Keele English deptrtment, Dr. Rebecca Yearling and Doctor Nick Seager, delivered a 90-minute interactive talk on ‘The Merchant of Venice’, which is one of the three plays being studied this year by Shakespeare Academy students. They also referenced ‘King Lear’ and ‘The Tempest’ and looked particularly at themes which unify the plays, such as the ‘Fathers and Daughters’ theme. 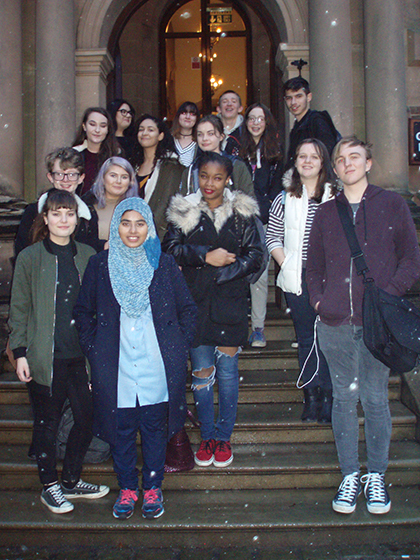 The students were privileged to have their seminar in the beautiful Keele Hall Old Library. Keele Hall is a 19th century Grade II listed Mansion, surrounded by stunning gardens and lakes and is positioned on the Keele University campus. Students, who participate in Shakespeare Academy activities as an enrichment option, worked with English Curriculum Leader, Therese Down, in pairs and in plenary, to prepare to complete the OCR paperwork necessary for recording their Extended Project planning and development, and considered what artefact they might create in response to the plays studied. The Extended Porject Qualification is a piece of private research that is assessed like an A level and can significantly boost students’ chances of getting a top university place. This trip followed a bespoke workshop from Paul Prescott, Shakespeare Professor at the University of Warwick, at the Birthplace Trust in Stratford in November, when he talked to them about ‘The Tempest’. After Christmas, two academics from Oxford University’s English department will be coming to the College to deliver a two-hour seminar on all three plays that the students are studying this year.